Petition: Stop the Horrific Ripping-Apart of Fox-Cubs in Illegal Fox-Hunt 'Cubbing'! 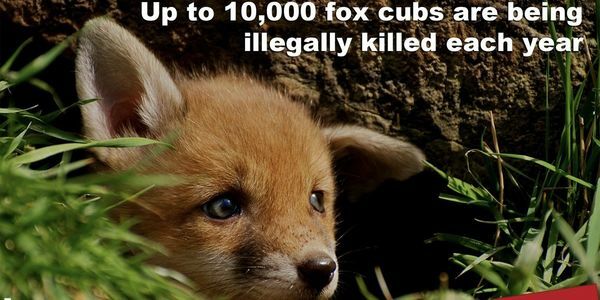 Stop the Horrific Ripping-Apart of Fox-Cubs in Illegal Fox-Hunt 'Cubbing'! Please sign this petition to help to stop the barbaric killing of fox-cubs. 'Cubbing' starts in August and ends in November each year. In the name of hunting, young fox-cubs are used to train young hounds, in a reduced woodland with little to no chance of escape before being ripped apart. Underground holes - fox earths and badger setts - are blocked to prevent the cubs having a safe place to hide. If these poor creatures escape underground, 'terrier-men' are on hand to ensure that they dig out the fox-cub. Hunt followers surround the woods to ensure that any terrified fox-cubs trying to escape are 'flushed out' and scared back into the mouths of the pack of hounds. There need to be much tighter controls on ensuring that the illegal act of 'cubbing' does not take place and strict sanctions for those whom aid and abet it. Over 80% of people in the United Kingdom are against hunting in the United Kingdom. Please sign this petition and demand that our government and Defra uphold the law against this cruel and outdated practice, so that 'cubbing' is consigned to the history books forever. Join Care2 on the march for wildlife, 12 August 2017 in London - to stand up against badger culling, fox hunting, cubbing and grouse shooting. RSVP here. The march against fox hunting last month had a huge impact - the government has pledged not to repeal the hunting act in this parliament. But illegal killing of fox cubs continues. So we must keep up the pressure and keep demanding they take action to save fox cubs! Britain's foxes need you more than ever! Join the march against hunting, 29th May in London. Theresa May has announced that if the Conservatives win the election there will be a vote on repealing The Hunting Act! Britain's cubs need you more than ever! Theresa May's announcement attacking The Hunting Act, means we need a call to arms. We are thrilled to invite all of you caring signees and your friends to our peaceful demo and delivery of the anti-cubbing petition, featuring some impressive guest-speakers. See the Facebook page, 'Stop Hunting Fox-Cubs!' for details and ‘like’ the page to stay informed. Well done all for joining this campaign!